The way of life of the Chinese allowed longevity. Elderly surpassing 110 year-old with mental and physical conditions are optimal, example of good living. The topic was discussed during the last meeting of this semester of the Chair China. The surgeon Juan Buitrago Ruiz in Traditional Chinese Medicine specialist, was in charge of guiding the conference. According Buitrago, the highest rate of long-lived population is in China, a reality that responds to their way of life: "Frequent work, sports exercise constant, attention to hygiene and reasonable food ", inter alia. Speaking, Buitrago made a historic journey through the history of China and its main leaders who lived exceeding one hundred years. "Some Chinese sources indicate that the Chinese Taoist master Li Ching-Yuen, herbalist, quack, practitioner Chi Kung and tactical advisor of the Chinese Government, lived to the age of 256 years and is known as the oldest man in the world ", said. Li's longevity is attributed to a set of breathing exercises and movements coordinated with specific sounds. "One of the disciples of Li stated that this claimed that his longevity was due to performing daily exercises, correctly and sincerely ". Anecdotally, Buitrago told the doctor that this character is attributed 180 offspring, and at the time of his death he was with his wife number 24, "For the other 23 and was buried ". Even, an article from The New York Times reported on the life of Li. They cited the response of the secret to his long life: "Keep a quiet heart, sit like a tortoise, walking fast like a dove and sleep like a dog ". 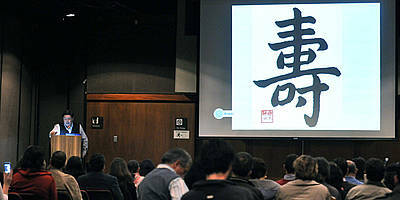 In his lecture, Buitrago referred to other Chinese practices that ensure longevity and good living. One is the facility to accommodate climate change and the natural environment. Thus, Chinese customs adapted according to the season in which they are. "In Spring, take rest and joy serves to raise the body's functions. In summer, it is important to reassure, it is how to get to a hill of freshness. In winter, not withstand cold, remain protected and use cotton shirts, eating foods high in fat; and in summer avoid ". Other factors influence the longevity tacit refer to the "seven permanent stock", addressed to human welfare. "These stocks are: the tranquility, of goodness, of joy, just feeling, of joy, of agreeableness and satisfaction ". These aspects are difficult but not impossible incorporating "cultural and scientific development and modernization of the world today". To conclude his presentation, Buitrago, who also serves as chairman of the Organization for Colombo-Chinese Relations and CEO of China-expressed Center a reality based on Chinese reality: "The mystery of the existence of elderly living in the field testifies that family harmony and respect for the descendants constitute the secret formula that guarantees them happily spend old age".